‘A thought-provoking story that flies off the page. It reveals a whole other side to World War II. Soldiers suffered, were wounded, lost their lives… but others, like Ada in this novel, endured a very different kind of war. This is a beautifully written novel by an author who not only knows her stuff, but has a terrific ear for dialogue. Ada’s story stayed in my mind for days after I’d finished reading it.’ Sue Cook, broadcaster and novelist, author of On Dangerous Ground and Force of Nature. ‘A powerful and gripping tale of longings and dreams … it is the character of Ada Vaughan that lingers, her resolve, her passion and her flaws’ Cecilia Ekback, author of Wolf Winter. ‘This novel deserves absolutely to be five out of five stars.’ Comet Readings. Spanning the intense years of war, THE DRESSMAKER OF DACHAU is a dramatic tale of love, conflict, betrayal and survival. It is the compelling story of one young woman’s resolve to endure and of the choices she must make at every turn – choices which will contain truths she must confront. London. Spring 1939. Ada Vaughan is eighteen years old and desperate to escape the poverty of her life in Lambeth. A beautiful and skilled seamstress, she starts work for a modiste in Dover Street. She is on her way to a career in couture when she meets Stanislaus von Lieben. Seduced by the promise of wealth and glamour, blind to warnings of war, she travels with him to France. When the Nazis invade, Stanislaus abandons her and Ada is forced to live on her wits alone. Resilient at every turn, Ada will survive the only way she knows how: with her talent. 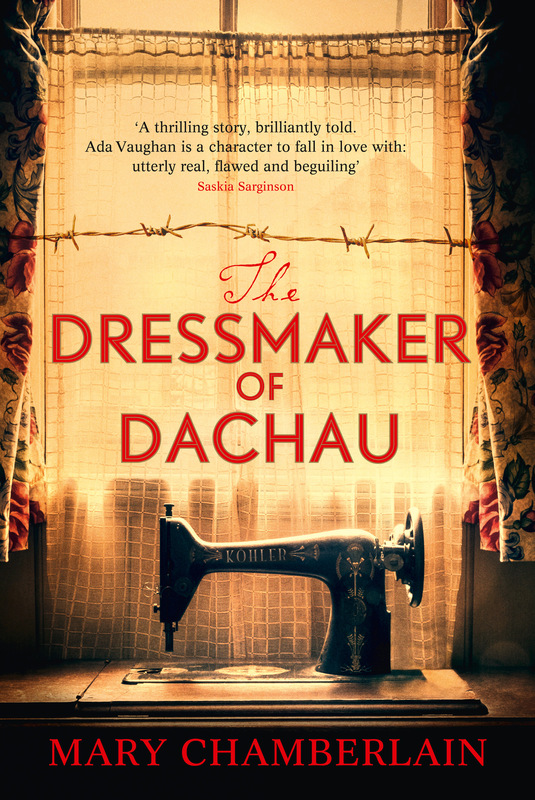 THE DRESSMAKER OF DACHAU was published by the Borough Press, HarperCollins in 2015 and has sold to 18 countries. a ‘coup de coeur’ in France (under the title ‘De Pourpre et de Soie), and has garnered wonderful reviews from media and bloggers elsewhere in Europe. Check out the consumer reviews on Goodreads and Amazon.